Fogo De Chao Churrascari is a Steakhouse, Brazilian, and Steak restaurant where most Menuism users came for a romantic date, paid between $25 and $50, and tipped between 15% to 18%. 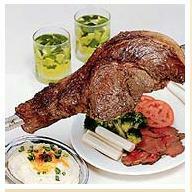 1 review of Fogo De Chao Churrascari, first by PandaLHU. So after reaching out to everyone about this place we head there ourselves. I called Thursday to make reservations and was told anytime before 5:00 (they open at 4:30) and anytime after 9:00. So we were already downtown all day so we said 4:30. There weren’t many open tables at 4:30. My husband and I were very lucky (at least we thought) because we got a table that is right up against their wine cellar. They offer many different variety of wines from domestic to European to South American to Australian and Italian wines. Instead of ordering from a traditional menu, Fogo de Chão offers a prix-fixe system where guests can sample the entire menu, or just focus on their favorite items. The menu eatures unlimited servings of 15 different delectable cuts of fire-roasted meats, a sumptuous buffet of gourmet salads and fresh-cut vegetables, and a variety of Brazilian side dishes. Each guest uses a two-sided disk to control the pace of their meal. The green side signals the Gaucho chefs to bring out skewers meats to carve at the table. The red side indicates a stopping point. Turning back to green lets the Gaucho chefs know to start offering the meats again. So I recommend not to eat anytime soon before you come! The salad bar was the most gourmet salad bar I have ever seen. It had some many things are it from smoked salmon, proccito, sin-dried tomatoes, fresh mozzarella, green and white asparagus and the best caesar salad dressing I have ever had. After you sit down they explain how things work and tell you that you can go to the salad bar as many times as you want- 1 trip totaste the things was more than enough for me with everything else! Once you turn your disc green you are in for food a plenty! THey first bring side dishes of warm cheese bread, fried bananas, crispy hot polenta and seasoned mashed potatoes. The fiend bananas where wonderful. Neither of us were very impressed with the mashed potatoes (they were very thing). Then comes the meat. And man let me tell you- between the 2-3 people who take care of you and the men who bring the meat around they move… they are constituently dogging each other but their wasn’t one spill! Some of our favorite of the 5 different types of meat were the filet mignon wrapped in bacon, Beef Ancho (rib-eye), and our favorite was Picanha (sirloin seasoned with sea alt or garlic). Overall we extremely enjoyed ourselves even tho we were full to the brim! If you are against buffet and all you can eat places this is not where like those places to dont pass it up! Before we left I have the opportunity to talk to the manager. As we were talking I was blown away over a statement he said: We were joking about a service to roll you to your car and his reply was if he gave me one I would have to come back at the end of the night and get him to his car because they would have over 1,000 people in that night! So save your pennies ($45 a person for dinner w/out drinks) and GO! These dishes from the Fogo De Chao Churrascari menu are contributed by Menuism users directly, as part of a restaurant review, or as part of a photo upload. Do you own Fogo De Chao Churrascari? Contact us to connect with your diners. 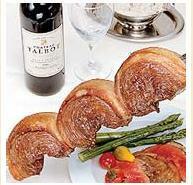 Fogo De Chao Churrascari is located near the cities of East Case, Fells Point, Canton, and Morrell Park. People found this by searching for: What Is Beef Ancho, Downtown De Baltimore, All You Can Eat Steak House In Baltimore, All You Can Eat Steak In Baltimore, Fogo De Chao Baltimore Menu, All You Can Eat Steak Delaware, Fogo De Chao Downtown Baltimore, Fogo De Chao Baltimore, and Brizilan Beef Baltimoe Md.